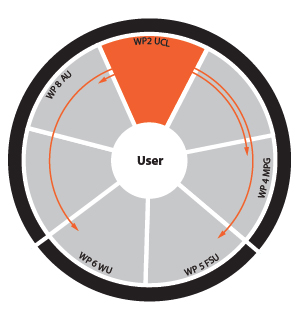 UCL will lead WP2, which will provide the core requirement of timely and consistent spatial data to be used as input to the BACI analysis framework. These will primarily be EO data, but also additional spatial data such as elevation and slope/aspect. WP2 will provide a generic, scaleable framework for combining data from multiple streams for input into BACI index analysis, effectively a multi-source, surface change detection system. The output of WP2 will be: a system ‘state vector’ representing the state of a point/region on the land surface at a given time as a function of input data (reflectance, Δreflectance i.e. change in reflectance since the last observation, LST, backscatter and multi-temporal backscatter statistics, interferometric coherence, soil moisture, freeze/thaw, snow characteristics, albedo, vegetation state, ancillary), with uncertainty. The framework will be demonstrated at core project sites at fine scale, as well as at scales of the selected regional focus areas. The framework will generate (within spectral domains) wavelength-consistent surface products, and assess options of how other, higher spatial resolution intermittent data streams can be integrated. To provide a novel framework for optimally combining EO data from a range of sources, at a range of scales and wavelengths. Input will comprise: passive and active optical, emitted and active microwave EO data. The framework will ingest data from current and historical sensors but the framework will specifically allow for the ingestion of forthcoming data, particularly from ESA Sentinels. Output will be a description of surface state with uncertainty that can be ingested directly into the BACI analysis, without requirement for conversion to higher-level model-derived products both regionally, with ‘cut-outs’ and options for near-real time assessments.